It’s been a hard few years for Harley-Davidson, with falling sales and, more recently, getting stuck in between trade wars. But the American icon has just made a massive announcement that could very well change the path of its future. There are a lot of exciting announcements here, so we’ll split it up into different sections. In a nutshell, the company has announced three new modular platforms that will span 500cc to 1250cc. The company will also be launching the road-going Livewire electric motorcycle by August 2019, and many more (smaller and more affordable) models will join the Livewire family in the coming years. What’s most exciting for us is the company’s announcement that it will be developing an affordable, small capacity, 250-500cc bike for India and Asian markets. This growth plan, tagged the ‘More roads to Harley-Davidson’ span out to the year 2022 and it comes as part of the two-wheeler giant’s intention to launch 100 new motorcycles by 2027. 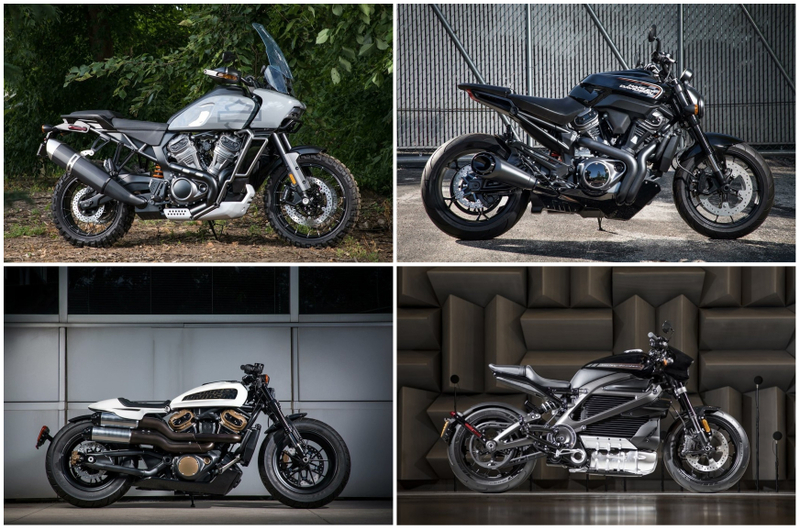 Harley has also given us a sneak-peek into its upcoming offerings which will be launched by 2020; the list includes the Pan America 1250, a 1250cc Custom model and a 975cc Streetfighter model. Scroll below for more! After the locally manufactured Street 750 and Street 500 (sold overseas), Harley wants to take its accessibility a notch higher. It has plans to develop a 250cc to 500cc motorcycle for Asia and emerging markets. In its release, the American two-wheeler manufacturer specifically mentioned that this new motorcycle will be an important product for the Indian market. It also mentioned that the sub-500cc Harley-Davidson will be built in alliance with a manufacturer based in Asia. Not much more has been revealed and the manufacturer says that it will announce more at a further date, but that leaves us free to speculate. Interestingly enough, companies like KTM, BMW and Triumph, who have tie-ups with local manufacturers (Bajaj, TVS and Bajaj respectively) don’t have any local manufacturing presence of their own in India. However, Harley-Davidson has a full-fledged manufacturing plant in Bawal, Haryana, so the specifics of this alliance remain to be seen in terms of how it will work. What the current press-release does mention is that the alliance will include the distribution network so as to allow higher accessibility and market penetration to customers in India and other Asian markets. As for the motorcycle itself, again, precious little is known at the moment. But given the fact that Harley’s modern range of products has adopted new technology while maintaining its traditional core elements, we are hoping that it will be powered by a V-twin motor. Then again, single-cylinder Harleys have existed in the past so one could argue that they are a part of the brand’s history, too. The Pan America 1250 has to be among the most revolutionarily motorcycles that the brand has shown off in this release. The image shared with us is that of the prototype, and has a straightforward and likeable industrial vibe to it that we can’t help but associate with the Royal Enfield Himalayan. Powering the bike is an all-new 1250cc V-twin motor which gets modern features like liquid-cooling and DOHC. The bike also appears to get modern components like LED headlamps, radially mounted brake callipers and an upside down fork. Lending to the rugged appearance are spoke wheels with off-road tyres. If you’re tempted by the idea of a Harley-Davidson adventure tourer, you will have to be patient, as the Pan America 1250 will only be launched in 2020. As the name suggests, the new Streetfighter 950 is a proper naked street motorcycle. With its muscular styling, the Streetfighter 950 looks like the spiritual successor to the XR 1200. The round headlight, chunky fork, sharp fuel tank and mass-forward design are textbook styling elements for a streetfighter. Powering the Streetfighter 950 will be a new liquid-cooled, 950cc, V-twin motor. As with the Pan America, this engine is also liquid-cooled and uses a DOHC head design. From the teaser video Harley has released, the engine sounds angry and quite quick revving, which is a remarkable departure from the lumpy and lazy-revving engines in most of the brand’s motorcycles. Keeping with tradition, the Streetfighter prototype uses a belt drive mechanism, unlike a chain drive as seen on modern performance bikes. The production version of this new Harley-Davidson offering will be launched in 2020. In the teaser video, we can also spot Indian designer Chetaan Shedjale working on the sketches. Chetaan is a senior designer at Harley-Davidson and in the past has helped design the Street 750 and the Street Rod. The upcoming Harley-Davidson Custom 1250 looks like a modern Bobber-styled motorcycle. The new motorcycle looks set to be a modern rival for the Indian Scout range. The retro-modern styling of the Custom 1250 is attention-grabbing and the prototype has also been equipped with a tubular swingarm. It will be sharing its 1250cc, liquid-cooled, V-twin engine with the Pan America 1250, but the motor will be in a different state of tune to suit its characteristics. The Custom 1250, Streetfighter 950 and Pan America all appear to be using brand new frames. In addition to the new products, Harley intends to boost its online presence with an evolution of the www.harley-davidson.com experience. Further, the brand has revealed that it is looking to establish strategic alliances with global leading e-commerce brands, so the day may not be far when you could buy your Harley off a website like Amazon, for instance. The company is also looking at including smaller urban store fronts to expand brand exposure and also propel apparel sales. Significant investment will be required to fund this enormous strategic plan. Harley says it plans to fund this entire operation completely via ‘comprehensive cost reduction and reallocation of previously planned investment and resources, including operating investment through 2022 of $450 to $550 million and capital investment through 2022 of $225 to $275 million’. With the ‘More Roads to Harley-Davidson’ plan, the company believes it will generate $1 billion of additional revenue in 2022 as compared to 2017.